Two men challenging their conviction for the murder of an elderly woman during a botched robbery will have to wait for a decision by appeal judges. Patrick Docherty, 45, and 40-year-old Brendan Dixon were ordered to serve at least 25 years for killing Margaret Irvine in Galston, Ayrshire, in 2003. Both men allege they did not receive a fair trial. Lady Paton said it was "a difficult and delicate case" and a ruling would be issued in writing at a later date. The original trial heard that Docherty and Dixon broke into Mrs Irvine's home on Barward Road, switched off the electricity and struggled with the pensioner. They then tied her hands behind her back with a belt and punched her on the head and body. 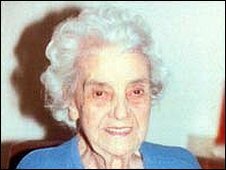 Mrs Irvine died of asphyxiation after a duster was forced into her mouth. She was found lying on her bed by her home-help hours after she was murdered on 28 September, 2003. Both men lodged special defences of alibi and claimed they were elsewhere at the time of the murder. But a jury at the High Court in Kilmarnock found them guilty of murder. At the Court of Criminal Appeal in Edinburgh they claimed they did not get a fair trial because the jury did not get to hear about the sighting of a tattooed man in Mrs Irvine's garden on the Sunday she was murdered. The man, Peter Fraser, had a history of violence and drug abuse. Restaurant worker Sheena Orr who had been passing the house was not called as a witness at the original trial. Docherty's legal team said that since then it had emerged that there is a 16-hour gap in the alibi offered by Mr Fraser when he was interviewed by police and eliminated from the murder hunt. Gordon Jackson QC, for Docherty, said: "There has been a miscarriage of justice because that evidence was not placed before the jury." Advocate depute Alex Prentice QC, for the Crown, said the two men had been convicted on the basis of "a classic circumstantial case." He claimed police had disclosed to the men's defence lawyers everything they were obliged to hand over, and he said the sighting of the tattooed man "did not amount to new evidence of any materiality".